Fitch has cut Malaysia’s sovereign debt load rating from “stable” to “negative” following PM Najib’s slim win. The Malaysian government has had a hard time coping with the May election, which resulted in voters deserting the ruling party in droves and Prime Minister Najib Razak relying on gerrymandering to secure another five-year term. Transparency International said the election did not reflect the will of the people. In its aftermath Najib and senior figures in the United Malays National Organization (UMNO) tried to be conciliatory – particularly with Chinese voters fed up with a political system that discriminates against them. But their efforts have been erratic and included another unwanted effort to ban the use of the word “Allah” in non-Muslim communities and the banning of Muslim girls from a beauty pageant. Rights groups have also accused the government of abusing laws to detain opposition figures. Much of this has been led by Foreign Minister Anifah Aman, an ambitious man whose brother Musa is the chief minister of the East Malaysian state of Sabah, home of many electoral irregularities, illegal logging and corruption, and a dormant insurgency launched from the Southern Philippines. Human rights groups, lawyers, independent journalists and opposition politicians have gone a long way in explaining why most Malaysians do not like their government. Now the ratings agencies are also voicing their opinions and they are not good either. Fitch has cut its outlook on Malaysia’s sovereign debt from stable to negative, saying the divisive election result has worsened prospects for much-needed economic reforms. According to Fitch, public finances were the country’s key rating weakness. “Prospects for budgetary reform and fiscal consolidation to address weaknesses in the public finances have worsened since the government’s weak showing in the May 2013 general elections,” the ratings agency said in a statement. 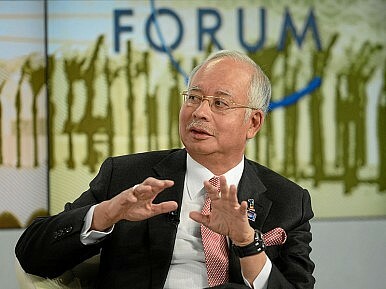 While the merits of ratings have been the subject of intense debate ever since the Global Financial Crisis erupted in 2008, they remain fundamental to businesses, governments and their respective economies – particularly in countries like Malaysia which harbors ambitions of becoming a developed nation. Ratings determine the cost of debt, influence money policy and interest rates, and in some countries serve as a chief economic factor for governments – often in banana republics that are juggling junk bonds within a bankrupt economy. Standard & Poor’s and Moody’s have allocated a stable rating to Malaysia, but where one ratings agency goes the others are sure to follow. Fitch said the election result had only exacerbated multi-ethnic divisions within Malaysia. It noted Najib could face a leadership challenge from within his own party by October, adding Malaysia was comparable with Mexico, which had a lower rating of BBB+ compared with Malaysia’s long-term foreign debt rating of A-. Politics and racial divides aside, Fitch noted that due to persistently high deficits the federal government’s debt reached 53.3 percent of gross domestic product at the end of last year, up from 39.8 percent at the end of 2008. Malaysia’s problems are many. Challenges to Najib’s leadership should be expected after he delivered one of the most dismal performances for the UMNO in recent elections. His deputy Muhyiddin Yassin has been touted as one possible challenger, although a bid by Aman, with his brother’s backing, cannot be ruled out.